Looking at it honestly, every blade I’ve ever owned, loved, even hated, is overqualified for the job of being my EDC. Which makes reviewing knives like the Spyderco Roadie a bracing experience. You expect a knife this small to have limits. And it certainly does. But for me – domesticated, deskbound, and suburban – it did everything I asked of it for a whole month without issue, and made me question the wisdom and value of owning so damn many knives. But side-by-side with this access of regret, there was a familiar surge of knife nerd pleasure at experiencing an interesting new design from one of my favorite companies. The Roadie can do all that I need it to, but is it good enough to merit a spot in the permanent collection? Let’s take a look. The Roadie has a 2-1/8” blade counting the finger choil and a cutting edge of 1-3/4”. Handle length with the choil is 3-5/16”, and 2-7/8” without. Overall length is about 5” and it weighs just under an ounce. It is made in Maniago, Italy. Some knives have different ‘regions’ along their cutting edge, but Roadie’s consists of a single continues run of gentle belly. It functions nearly like a straight edge, but the slight curve imparts muscle in certain chores like cutting zip ties. The small blade excels at small tasks: opening letters, cutting tape on boxes, nipping stray threads. It’s airy and nimble, but thanks to the thick stock it still feels substantial enough to use with confidence. I would like a more acute tip, personally. And notably, the Roadie can’t do food prep, so if that’s a central cutting chore for you, be warned that this knife will not cope. But outside of these complaints the Roadie gets a lot done with very little. Being a Maniago-born Spyderco the Roadie has N690Co steel. This is superb stuff. It can be sharpened to a fine, clean edge, and stays sharp for a long while – significantly longer than VG-10, and a smidge longer 154CM. Moreover as it dulls it doesn’t fall through the pronounced ‘steps’ of baser steels like 8Cr13MoV or 420HC. That is, it doesn’t go from ‘screaming sharp’ to ‘semi-dull’ with no apparent transitional phases in between. Its wear pattern is much more gradual. In this regard it reminds me of S35VN, albeit not quite so long-lived. It does, however, have top-tier stain and corrosion resistance. The Roadie’s handle consist of two pieces of FRN, lightly textured and slightly contoured. A standout feature is the half and half finger choil. The choil itself and the base of the blade spine are both covered in jimping. The ergonomics are good. Despite having a handle not much longer than a toothpick, the Roadie is quite accommodating. I don’t hear angels singing when I hold it but I never felt cramped, even with my large hands – which is quite a feat. The choil seems like a great idea and works fine, but it is (obviously) undersized compared to a standard Spyderco finger choil. It also isn’t really necessary on a knife this small. You’re going to have plenty of control over the blade just by virtue of the Roadie’s overall size. Instead of the choil, I’d like to see the handle thickened up a bit because the Roadie almost feels too thin. Most traditional knives in this size class are a little more ample, and better in the hand for it. More pronounced texturing on the scales would be great too. As it is I have cut myself a couple of times while closing the knife because my fingers slid around. No pocket clip here – but obviously you don’t need one. Loose in a full-size pocket, the Roadie is invisible. The only downside is that it can get tangled up in your keys, or slip out and slide down between the couch cushions without you knowing it. One time I pulled out my keys and the Roadie went flying out of my pocket, taking a pretty nasty ding as it landed. All of this is a function of its Lilliputian dimensions and a not a mark against the knife, but worth knowing if you plan on carrying the Roadie in your main pocket. But here’s my pro-up: carry it in your watch pocket. I’ve never been an advocate of the watch pocket carry; I always thought it was one of those weird Knife Nerd affectations, like pocket sheaths or whipping out your folding knife to cut steak in a restaurant. But the Roadie is perfect carried that way. It’s readily accessible, stays in place, and doesn’t peek out of the top like most folding knives would. Non-believers, give it a try. Although it’s a slipjoint, the Roadie is not a traditional knife in any real sense; it wasn’t made with considerations of walk and talk or pull weight in mind. It isn’t meant to ‘feel nice’ in the way a GEC or a Case might. There’s nothing poetic or soulful about this knife’s lockup or deployment – but it undoubtedly works. There’s a watery half stop before the blade snaps fully into the open position. The spring tension when open is about where I like it: easy to intentionally overcome, but stout enough to preclude accidental closure in all but the most extraordinary circumstances. Combined with the half-and-half choil, there isn’t much need to worry here. 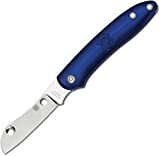 We get a Spyderco original for deployment, the Double Dent: a shallow concave ‘dent’ on either side of the blade that you pinch to open the knife. These dents have been left with a little rougher finish than the satin on the rest of the blade to aid in grip. They work great, definitely better than the average nail mark. Like the Round Hole, they do dictate the knife’s profile to a greater degree than other two-hand knife opening methods, but the extra width on a knife so small is not a problem. A secondary, although welcome, advantage of the Double Dent is that it is easier to clean out than a nail mark. I find nail marks to be a common problem area when it comes to rust and that’s largely because they are so hard to properly clean out. You won’t have any issues like that here. The Roadie did everything I asked of it with aplomb. If you live a relatively undemanding life it’s a fun way to cover all your bases in as small a format as possible. Even if you ask for more out of your EDC it’s a great backup knife or a people-friendly option for delicate situations. It may not be able to with you on an airplane right now, but it can go anywhere else without scaring anybody and without making you feel unprepared. A note on price: at $50, the Roadie is expensive for what you’re getting. But it’s so friendly and fun, I can’t really crack down too hard on it for this. My particular Roadie originally came to me on loan from Gear Geeks Live After Dark co-host Mike Rixman. Within ten minutes of opening the package I made an attempt to buy it off him. I got mine for a little less than $50, but even at full price I would have already gotten my money’s worth in terms of carry and use. I think you’ll be surprised how often you reach for the Roadie, and I recommend it highly. I recommend purchasing the Spyderco Roadie at Amazon or BladeHQ. Please consider that buying anything through any of the links on this website helps support BladeReviews.com, and keeps the site going. As always, any and all support is greatly appreciated. Thank you very much. Mine was easy to open when I got it – although it had already been used and carried by the previous owner before it came to me. If mine is a normal indication of what a “broken in” Roadie is like, then you won’t have any issues. I’m not sure if this will help but, unlike most traditional-style knives, the Roadie’s pivot can be adjusted – you might be able to make the opening lighter that way. That comment about the Roadie being enough knife being enough for a deskbound suburbanite reminds me of the Peanut pattern. In the days when a lot of towns people carried Stockmans, many liked the Peanut pattern. It is a small knife, <3" closed. I do prefer knives I can get all 4 fingers on, but I am finding the utility in this pattern. It is thankfully larger than the Victorinox Classic. Maybe you should look at this pattern. Beyond the ubiquitous Case with their associated steels, Queen Cutlery makes it with D2 blade steel. Fortunately it can be had in Curly Zebrawood, a line that is said to have kept their quality in the ups and downs of the company. I own a Case Peanut – one of the few multibladed traditionals I enjoy carrying and using. I have the classic yellow Delrin with carbon steel. Sad to say that my particular Peanut has been the subject of some mistreatment, neglect, and subsequent cackhanded restoration/repair attempt on my part, but it still works and I still enjoy it. One thing I love about the Peanut is the ergos. It might not QUITE fit all four fingers, but the fact that it’s thicker than the Roadie – coupled with the sway/curve/dogleg on its spine – make it pleasing to hold and use – maybe moreso than the Roadie. Talking about the Peanut makes me want to fix it up and carry it again. Very good knife. I didn’t know about Queen’s version of the knife. I love the idea of one in D2 steel. You know, I’ve used N690Co on a few Maniago knives, including the Spyderco Pattada, and to me it seems EXACTLY like VG-10. If you look at the chemistry, it’s very, very close to VG-10, so this is kind of plausible. In short I find N690Co quirky and good-but-not-great in use, with middling edge retention — identical to my feeling about Seki VG-10. Pointy tips are good! Even from a pure utility/EDC standpoint, an acute point helps to pierce wrappers, hull strawberries, etc. My favorite wharnies come with a good sharp tip. I’ve heard that N690Co is similar – if not identical – to VG-10 in terms of composition before. In my experience, it’s one of those AUS-8 vs. 8Cr things, where on paper they are chemically close but in practice I find that one significantly outpaces the other. In fairness however, I don’t have a huge pool of experience with either N690 or VG-10, so perhaps my divergent opinions on these steels will come closer together one day. Yeah, an adequate degree of pointiness is essential, even in more eccentric blade shapes – and maybe especially so in small knives like the Roadie. In a bigger blade you can maneuver the main edge to cut what you would otherwise need to pierce, but with so little to work with, sub 2″ knives really need to have a reliable, sharp tip to get into certain types of cuts. I liken steel to cooking. Give two cooks the same ingredients & recipe to cook and one can be much better than the other. It isn’t just the chemicals, but how they are handled. SG-2 & VG-10 have similar compositions, but SG-2 is a powdered steel that can be safely taken harder. Add to that the effects of a good heat treat and you can get very different results. I’d like to know how this knife directly compares to the Dragonfly, which is my present go-to small knife. When my Roadie arrived in the mail I was quite surprised by its small size. This quirky little knife is quite amazing in its portability and usefulness. The blade is very robust and holds an edge well. INMHO the roadie is one of Spyderco’s most unique offerings. Agreed all around. It really says something that it manages to stand out in a lineup that is already bursting with unique designs. You could definitely swing it with some light duty food prep like slicing cheese or peeling an apple. But its going to keep bumping up against the food with that choil, especially if you have a finger on it. It’s not the end of the world but it would probably get pretty annoying. Thanks for stopping by!